The city of Piedmont in the East Bay is a bit of a geographical oddity. It’s not even 2 square miles in size and is surrounded on all sides by the city of Oakland. If you take a close look, the borders of the town seem to make no sense. Instead of following streets or physical landmarks — like the borders of most towns do — in Piedmont the borders snake around, sometimes through the middle of homes. "I think it’s worth understanding the history and then we can ask questions as a community, ‘Is that still relevant today?' " he said. Now this is a story about Piedmont, of course, but as soon as we started digging around, we quickly found that the story of Piedmont starts in Oakland. In the late 1800s, Oakland incorporated, going from ranchland and small settlement clusters to becoming an official city. Almost immediately, it started to grow. 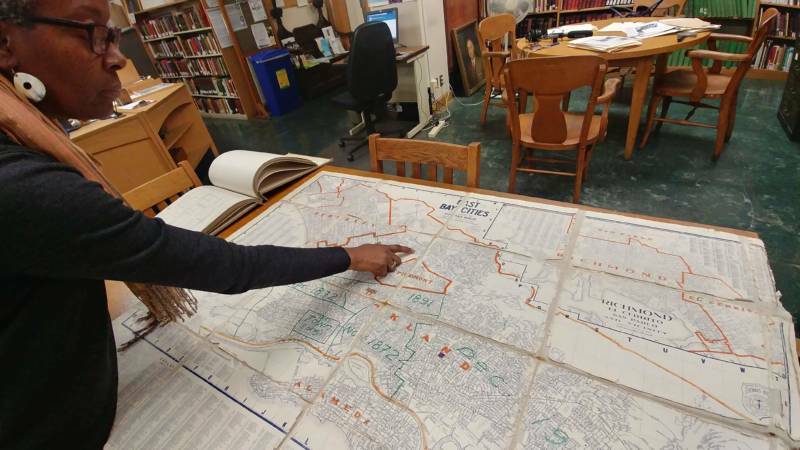 "Oakland leaders were under a very ambitious program to enlarge the city's boundaries and increase the population," said Oakland librarian Steve Lavoie, who curated an exhibit on Piedmont. This program to expand Oakland’s boundaries was called the Greater Oakland Movement. City leaders wanted to add more land and more residents. "This movement was not so much motivated by economic interests, but it was motivated by the anti-monopoly group, who felt that small cities were rife for corruption," said Lavoie. These leaders thought: The smaller the city, the greater the chance that greedy folks would do something — like raid the treasury or discourage business competition. "The original plan would have created the largest city on the Pacific Coast at the time," said Lavoie. This large city could come together only if they could convince all of the neighboring towns or communities without their own governments to join Oakland. Oakland started at about 170 city blocks in size. It grew from there by absorbing surrounding towns, whose names you might recognize as neighborhoods today. In 1872 it annexed the town of Brooklyn. Twenty-five years later came Temescal. It tried to get Berkeley, but Berkeley turned Oakland down. Each annexation required a vote by people in the town. Oakland city leaders kept eyeing new territory, and soon Piedmont was squarely in its crosshairs. “The City Council took a measure to vote an annexation of all the land in what is now Piedmont, and a whole bunch of other East Oakland hamlets,” said Steve Lavoie. 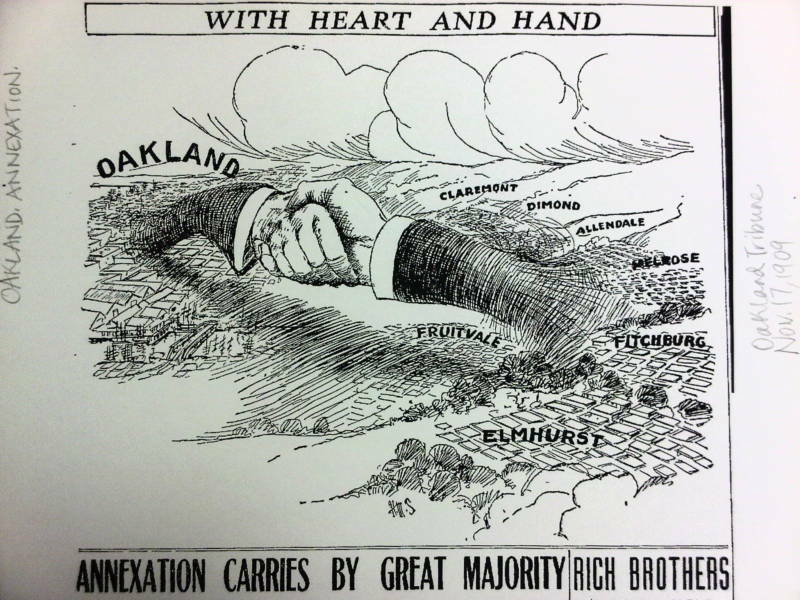 Oakland’s City Council set the vote on annexing Piedmont for January 1907. In their paperwork, they failed to name one of the districts that they wanted to annex and the vote was postponed until March. This left a really big opening for mayhem. "In the meantime, a group in Piedmont who opposed annexation jumped on the opportunity to try and incorporate Piedmont, as a way of preventing annexation into Oakland," said Lavoie. During the delay in Oakland’s vote, some Piedmont residents, a mix of bohemian artists and business people, filed a petition to hold their own election to become a city. If they could beat Oakland to the punch, they hoped Piedmont would remain rural and undeveloped. They saw how densely populated Oakland was, and they didn’t want any part of it. Piedmont historian Ann Swift said convincing other Piedmonters to incorporate was no easy feat. "Hugh Craig and James Ballentine were the two leaders of the incorporation effort and they are having meetings every other night, practically trying to rally the troops and get everybody excited about creating this new city," she said. "But there was also opposition. It was not a slam dunk." Something that happened back in 1892 weighed heavily on the minds of voters. "The Piedmont Springs Hotel, which was a great, huge, three-story white clapboard edifice that sat in the center of the city, caught fire early one morning in November," Swift said. That grand hotel was Piedmont’s biggest tourist attraction — a place where wealthy San Franciscans came to relax. Piedmont didn’t have city services, so Oakland’s Fire Department was summoned to come put out the fire. "In those days there were no fire hydrants. You had to bring the water with you," Swift said. "Well, imagine a team of horses dragging a big tanker full of water up Oakland Avenue for instance. Very, very difficult and slow going. So by the time the fire wagon's got to the hotel, they were just sitting with everybody else watching the embers burn." It took Oakland’s Fire Department two hours to get to the hotel. "It was completely gone. And that was what happened if your house in the Piedmont hills caught fire," Swift said. "So Piedmonters were adamant about wanting their own fire service, wanting someone right there in the center of this 1.8 square miles." All the Piedmont residents agreed that they needed a better solution for fire response, but they differed on whether better meant being a part of Oakland or figuring it out as their own city. "Piedmont had no experience with levying taxes and evaluating property and providing all these city services like street sprinkling. Back in the day, the streets were mostly unpaved, and especially in the summer you had water trucks that went through the city and watered down the streets so that it wasn't so dusty," Swift said. "Well, Piedmont had no water street-dusting things, and so all of that was going to have to be created. And there was a sizable part of the city who thought there was no need to go through that." The big vote on whether Piedmont should incorporate happened in January 1907. "Eighteen more men voted to become a city than voted to not become a city," Swift said. Piedmont was officially a city. But here’s where it gets tricky. Oakland’s vote to annex Piedmont still went forward. 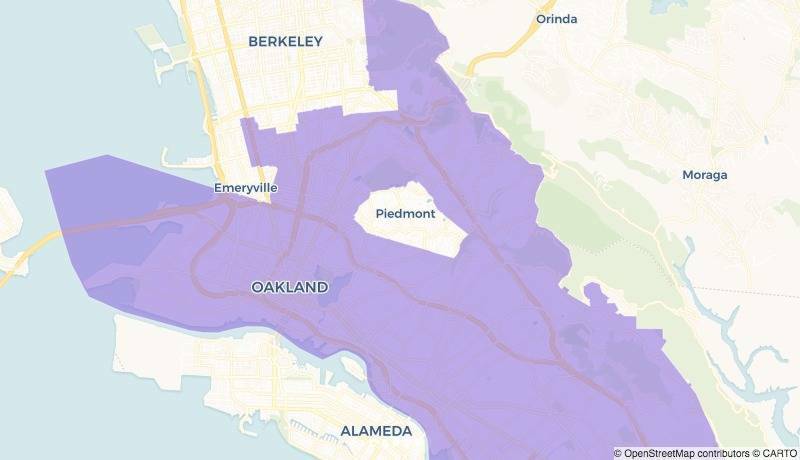 And in March a majority of Piedmont residents voted to join Oakland. The vote was 63-43. But this was impossible now that Piedmont was its own city. "The only thing that the opponents in the Piedmont hills can do is to hold an election to disincorporate [Piedmont]. So they hold another election in September, and more people voted to become part of the city of Oakland, to disincorporate Piedmont, than voted to stay a city," Swift said. So then why is Piedmont separate today? "It's one of those little nuggets of law that people don't know much about or care much about until they have to. It requires two-thirds vote of the people to disincorporate a city, and they failed to get two-thirds," Swift said. Piedmont stayed a separate city but its edges weave in and out of Oakland. This is because in their haste to file paperwork to incorporate Piedmont, proponents grabbed the only map they had on hand to define the boundaries — a map of the sewer lines that snaked underneath the houses in Piedmont. What does that mean for the borders of Piedmont today? "It means that there are 136 parcels ... a portion of which are in Piedmont and a portion of which are in Oakland, and/or, where one side of the street is in Piedmont and the other side of the street is in Oakland, like Rose Avenue,” Swift said. “Sewer boundaries wouldn't ever be what you would want to use in defining city boundaries. You’d want to use streets or major roads. But they didn't have that choice, so we're stuck with it." Liam O’Donoghue, host of the East Bay Yesterday podcast, contributed to the research on this story.